Hatching is hard work. 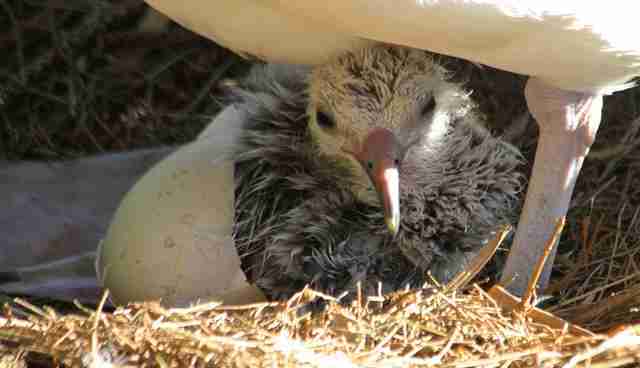 Take it from a Laysan albatross chick. 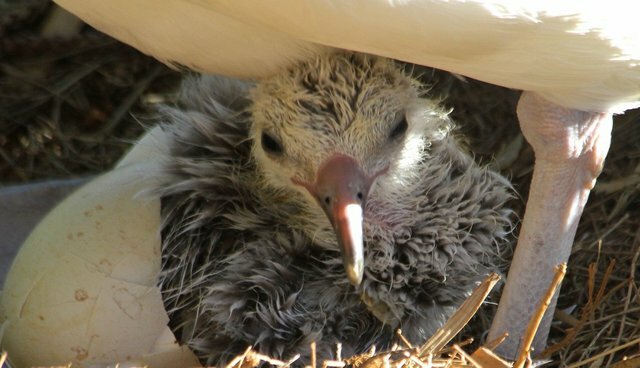 Last winter, on a bluff on Kauai's North Shore, a bird hatched one January day and the next day was an Internet darling. She was named Kaloakulua, and nearly two million viewers watched from the comforts of their electronic screens across 195 countries as "KK" ate her first meal of regurgitated squid; took her first steps on oversized, paddle-like feet; made friends with a common chicken; and, five and a half months later, leapt from a cliff 250 feet above the ocean and winged her way out of sight over the far horizon, where she will make her home for the next three to five years before touching land again. This past weekend, after 60 days incubating in a calcium enclosure and more than two days of pipping its way to freedom, another Laysan albatross chick (above) hatched live on the Cornell Lab of Ornithology #AlbatrossCam. Hawaiian cultural practitioner Sam Ohu Gon III provided the chick with the name of Niaulani. "Niau" translates from Hawaiian to English as "moving smoothly, swiftly, silently, peacefully" and "lani" translates to "exalted, sky, heavens." An appropriate name for a bird that will accumulate 3.7 million air miles in the course of a 50-plus year life. Viewers can watch Niau (knee-ow) go from a cute, fuzzy chick to awkward adolescent to fledging, majestic Laysan albatross over the next five months on the Cornell Lab #AlbatrossCam. Originally published as "#AlbatrossCam: The Internet's Latest Reality Show" at www.kimsrogers.com">www.kimsrogers.com. Kim Steutermann Rogers lives on the Hawaiian Island of Kauai with three chickens, two dogs, and one husband, and she regularly writes about Hawaii's natural history. Follow her blog at www.kimsrogers.com and her Twitter feed @kimsrogers.